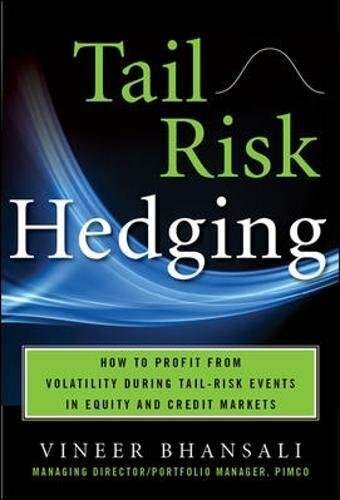 "TAIL RISKS" originate from the failure of mean reversion and the idealized bell curve of asset returns, which assumes that highly probable outcomes occur near the center of the curve and that unlikely occurrences, good and bad, happen rarely, if at all, at either "tail" of the curve. Ever since the global financial crisis, protecting investments against these severe tail events has become a priority for investors and money managers, but it is something Vineer Bhansali and his team at PIMCO have been doing for over a decade. In one of the first comprehensive and rigorous books ever written on tail risk hedging, he lays out a systematic approach to protecting portfolios from, and potentially benefiting from, rare yet severe market outcomes. Managing tail risk is today's most significant development in risk management, and this thorough guide helps you access every aspect of it. With the time-tested and mathematically rigorous strategies described here, including pieces of computer code, you get access to insights to help mitigate portfolio losses in significant downturns, create explosive liquidity while unhedged participants are forced to sell, and create more aggressive yet tail-risk-focused portfolios. The book also gives you a unique, higher level view of how tail risk is related to investing in alternatives, and of derivatives such as zerocost collars and variance swaps. Volatility and tail risks are here to stay, and so should your clients' wealth when you use Tail Risk Hedging for managing portfolios. If you have any questions about this product by Vineer Bhansali, contact us by completing and submitting the form below. If you are looking for a specif part number, please include it with your message.